It seems to be very common for one single fact to be taken as gospel. So because it breaks down "less", then it doesn't matter that it produces significantly higher levels of toxins than the others? I wonder about the logic behind this "conclusion" that was supposedly drawn, and as if any advice whatsoever should be taken from that. Analyses showed that PEG 400 produced significantly higher levels of acetaldehyde and formaldehyde than PG, MCT, and VG. Formaldehyde production was also significantly greater in PG compared with MCT and VG. Acrolein production did not differ significantly across the agents. The funny part is debating between using any of them as a "thinning agent" is like picking your poison. They're all bad for you, there's a conclusion you can trust. @artv4nd3l4y So is there a safe way to do this yet? Mix rosin with something for a cartridge that is safe and works? Rosin would be fine. Terpene based solutions are available that only use terpenes which are already found in cannabis (generally not taken from cannabis sources however). Testing has shown that dabbing will produce toxins only above 600F due to the terpenes, so at this time there isn't any research to say adding the terp solution is unsafe. Of course that doesn't mean it's safe either, but it's clear that PG and PEG are both extremely toxic. @artv4nd3l4y any reputable companies you suggest for terpenes? Safety, Taste and quality would be most important to me personally. The only branded terpene solution I haven't tried is from Puff Magic called Synergic. I would recommend Connoissuer Concentrates (from Mr. Extractor) above all else at this point, the funny part is it's the only one that really does what it claims. I've tried True Terpenes Viscosity Liquifier, and Fogg Labs Cutter which are both full terpenes solutions. Both were poor products overall, and added unnecessary amounts of bad taste, the final solution also grained out which is why I say it's funny to call it a liquidizer. Like I said, most of these companies are just contaminating your product to be perfectly honest. Hey guys what ratio of liquidizer to shatter are you using a saw a 2:1 is this pretty common? @CK13 how many mls of liquid do you ejd up with mixing 2:1?? I have been making my own refills. I’ve been doing 1 gram wax, 2.25ml of wax liquidizer and .75ml terps. Should I be only using one or the other? Do I not need the terps? 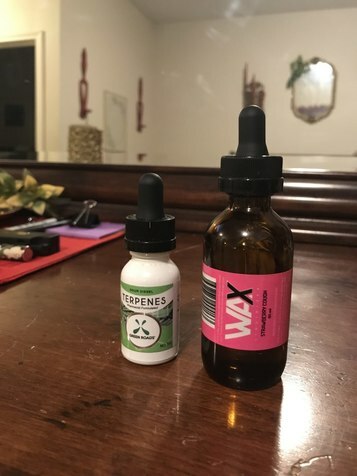 Just IMO of course, but wax liquidizer has bad stuff like PG in it, the terps will generally mix well enough to do it on there on at lower ratios that you're using but more terps than that in general. Who makes your terps, can you talk to them about viscosity or look it up and see how much to use byitself? If they are 'terp sauce' from somewhere, it might not be solvent-like enough to disolve fully and might not work as well as the WL, even though its probably better for you. I have tried a few of these mixes, cant stand the taste. I cut the ratio to a 1 to 1 just for that reason. Any kind that uses PG or expecially PEG... google it I can't spell but PropyleneGlycol or something like. those pose greater health risks...they are fine for ecig folks trying to quit smoking, which is how I quit years ago and I would highly recommend it if that's a deal for you, but stay away otherwise...and no way kids should ever get started on it. Green roads makes very good cbd and terpenes I have a bunch of it. They go into quite alot of detail in their literature and website. I also agree that wax cutter. Emulsifiers, etc are nasty and stay away from them. Vape pen for wax AND wax.